In 1995, at the UN Fourth World Conference on Women in Beijing, leaders from governments and civil society around the world came together and committed to ensuring that women and girls have the opportunity to participate fully in all aspects of life. This year marks the 20th anniversary of that moment. 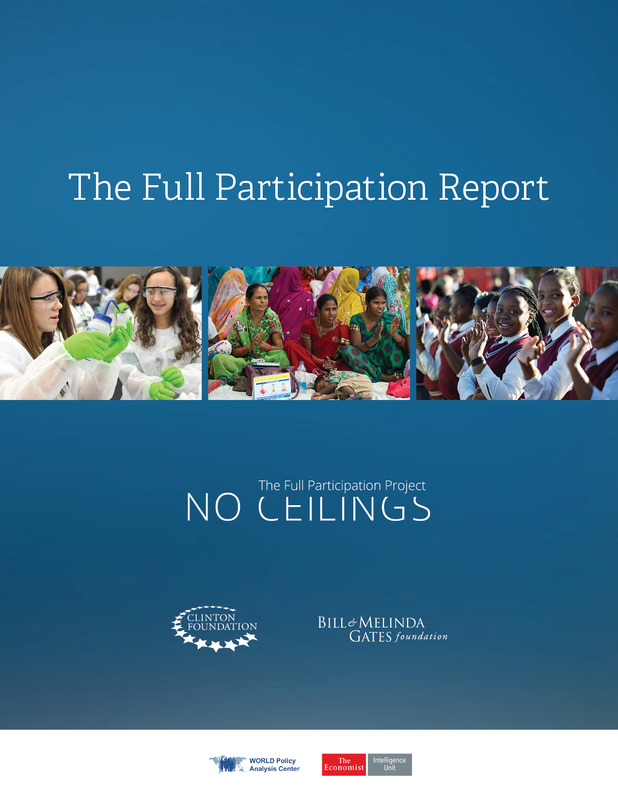 The Bill & Melinda Gates Foundation and the No Ceilings initiative of the Bill, Hillary & Chelsea Clinton Foundation have joined forces to gather data and analyze the gains made for women and girls over the last two decades, as well as the gaps that remain. This site and The Full Participation Report are the result—home to 850,000 data points, spanning more than 20 years, from over 190 countries. Through data visualizations and stories, we aim to present the gains and gaps in understandable, sharable ways—including by making the data open and easily available. To know how far we need to go to achieve the full participation of women and girls, we have to know how far we have come. We invite you to explore the site, dig deeper into these stories, share pieces that move you, download the data, and join us in our effort to address the great unfinished business of the 21st century. No Ceilings is grateful for the support of The Bill & Melinda Gates Foundation and the Wyss Foundation, as well as organizations and individuals, including the Cheryl Saban Self-Worth Foundation for Women and Girls, Corning, and the Leslois Shaw Foundation. For data updates and descriptions, visit the GitHub repository. For WORLD Policy Analysis Center data, visit this link.